Ferrets are pets that will never cease to entertain you with their antics. Providing a variety of stimulating and safe toys is a great way to keep your ferret entertained and happy. Ferrets will play with almost anything, but it is important to pick toys that are durable and won't pose a safety hazard to your pet. Swallowing pieces and parts of toys is one of the most serious dangers to your ferret when it comes to toys. 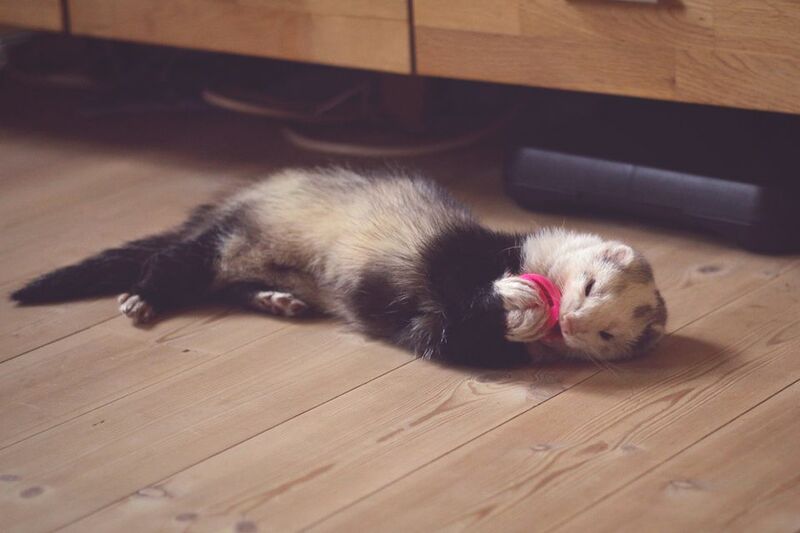 Make sure any toys they have are as ferret-safe as possible, and regularly inspect toys for any wear or loose parts and discard any that are coming apart. It isn't worth taking risks. Hard sturdy plastic toys (e.g. some cat toys). Hard plastic balls. Balls with bells or other noisemakers inside are often favorites. Soft balls made from fleece are also fun for ferrets to carry around. Large ferret balls with holes in them so the ferret can climb in and out. Cardboard boxes and paper bags. PVC pipes or commercial ferret tubes are usually a big hit. Hanging parrot toys (usually made with wood, heavy ropes, bells etc.) are usually fun and interesting to ferrets. Toys that have ropes or other long hanging bits are best used only under supervision, though, due to risk of strangulation. Rattles, teething rings and other small hard plastic toys made for human babies. Small soft/stuffed toys, especially with squeakers or other noise makers enclosed inside of them (avoid toys where the squeaker is visible or exposed since ferrets are experts at chewing them out and they can cause blockages if swallowed). Soft cloth bags for hiding and sleeping in - you can even get some that have a layer of crinkly material inside that makes them extra interesting to ferrets. Ferrets love hanging tubes for both play and sleeping in (they love hammocks too). Dangling toys like those available for cats -- but use only under supervision to make sure the ferret doesn't get entangled. Avoid toys made from soft rubber or latex (like most squeaky toys made for dogs) since they are too easy for ferrets to chew up and swallow. Also, avoid anything with small parts that could easily break off (or be chewed off). Also, watch for signs of breakage (or loose threads in the case of cloth toys) and discard any toy that could potentially cause problems. Providing a good range of toys, and rotating the toys and accessories in the cage will help keep life interesting and entertaining for your ferrets. Of course, it probably won't stop them from finding their own treasures by stealing your things and hiding them from you. However, if you keep them supplied with fun things to do, maybe your belongings won't be quite so inviting! For more ideas, see Top Ten Ferret Toys for a selection of toys your ferret might enjoy, that you can purchase online. Ferret.com is an online store devoted entirely to ferret supplies and has a wonderful selection of toys. Doctors Foster and Smith also carries a good selection of items for your ferret.